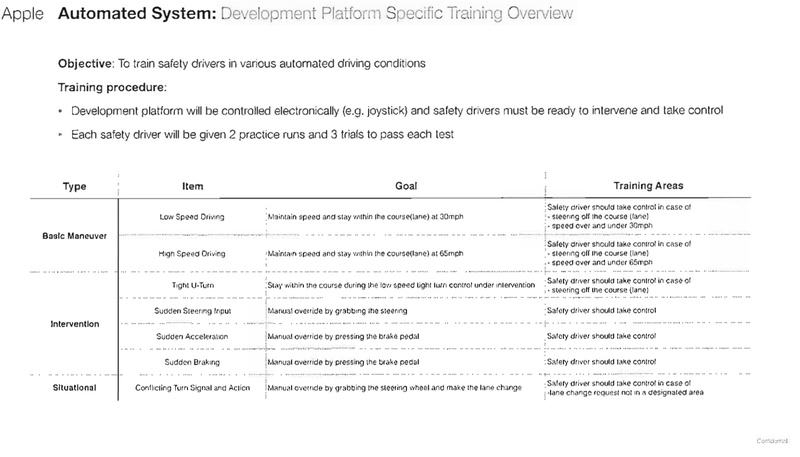 The company's "Development Platform Specific Training" document references an "Apple Automated System" and a "Development platform," alluding to the self-driving software platform Apple is rumored to be building after plans for a full autonomous electric vehicle fell through. Apple recently obtained a permit from the California DMV that will allow it to test self-driving vehicles on public roads, and as part of that process, the company appears to be training employees to use whatever system it's testing. According to the DMV, Apple plans to use three 2015 Lexus RX450h SUVs, which will be driven by six drivers with expertise in areas like machine learning. Based on the documents, drivers are required to pass seven tests as part of their training before being allowed to work with Apple's software platform. Each driver must complete two practice runs and three trials to pass tests, which cover topics like taking control of the vehicle at tight U-turns, sudden acceleration, sudden braking, and more. Pressing the brake pedal or grabbing the steering wheel in Apple's test vehicles will disengage the electronic driving mode, but drivers can accelerate without overriding the "drive by wire" mode. Apple's work in the car industry has been something of an open secret for the past three years. The company was originally planning to create its own autonomous vehicle, but pivoted to an autonomous driving software platform following internal strife and leadership issues. Siri can't even figure out which "to" "too" or "two" I mean to use with voice recognition. I sure as heck wouldn't trust Apple with my life. On one hand, I feel like self-driving car is a really interesting market to invest into. Can someone tell me who they are creating this software for? All the major automakers already investing billions in this space. They don't need Apple. Plus has Apple ever been successful being a piece of technology in somebody else's product? Unless their goal is their own vehicles for some self driving ridesharing service I see big fail all over this. It picks the right one for me. You have to give it context to understand what you mean. You can't just say, "to" and it expect it to know. But if you say, "I too would like to buy two flowers", it works just fine. This is a screenshot of an actual interaction I had with Siri yesterday morning after I got out of the shower. I had American Idiot by Green Day stuck in my head while showering, so I used "Hey Siri" to turn up the volume and play it. Or at least I tried—it was like Siri was having a stroke! The best part was after the music started playing, "Hey Siri" couldn't even hear me so that I could tell it to turn up the volume more. There's no way in hell I'd go anywhere near an Apple self-driving car! Are you forgetting about this massively successful product? …okay, maybe you have a point. We don't know that Apple's plans to build a car "fell through" because we never had any actual information that they were planning on building one. All we really had to support that idea was a lot of wishful thinking accompanied by the usual fantasy renderings. Not the same thing as reality, last I checked. Well, Apple is not building software for others here. I believe they just stopped the whole (real) car project because they thought the software is the most important thing here. Without software there is no hardware. 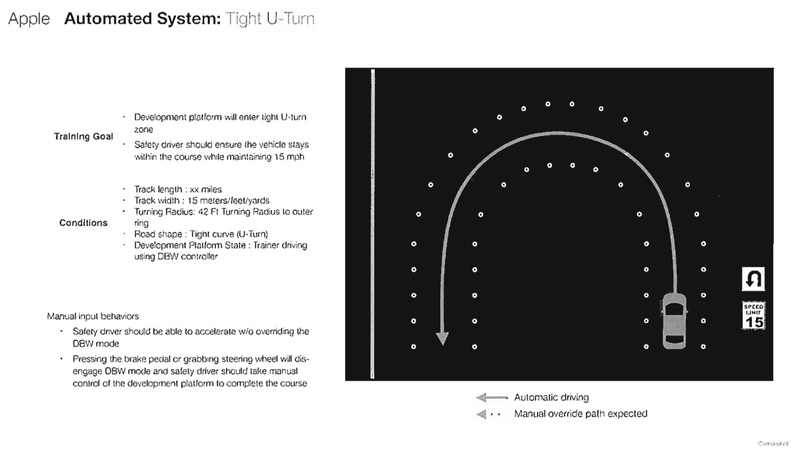 Building the car is probably the more trivial thing here compared to autonomous driving. They can build this when the software is ready. Problem is, whether you trust self driving cars or not, you still might be crippled or killed by one. Although the likelihood of it is far, far less than being crippled or killed by a human driver, who are responsible for enough US deaths every year to fill a large arena. Maybe I'm old fashioned but I would rather drive then wait on a computer error to kill me. Can I ride in the driver seat drunk if I'm not even driving? In the case of a computer error who would be liable for death or damages? I bet the big companies who push this tech would be as far away from liability as they could be. I would imagine that many of the regulations of today would still be applicable in the near future if self driving cars become reality. true autonomy is still sci-fi. 1: you must be sober.